With Angular 4 about to release its final version, we're wondering, what features will be included and what does the Angular team have in store next? I believe, the readers of this article are well versed or educated of Angular basics and also have hands-on experience. Please note: Google intentionally has not chosen the next version as “Angular 3” instead it will be “Angular 4” which is supposed to launch its final version in March 2017. Angular is getting more mature with its new versions. Google has a tentative plan to release in the month of March 2017. The Angular team announced that they will be using SEMVER when releasing updates. Patch: this version is to be released every week, with the exception of holidays. Minor: this version is to be released every month. Major: this version is to be released every six months, meaning two releases every year. You know switching from Angular 1.x to Angular 2.0 was a big-bang release. The concepts were dramatically changed but fortunately, the next version 4.0.0 will be a smooth shift and a major version that will be backward compatible with the previous release (version 2.x.x) for most developers but might remove APIs that were deprecated two major versions ago (6 or more months ago). 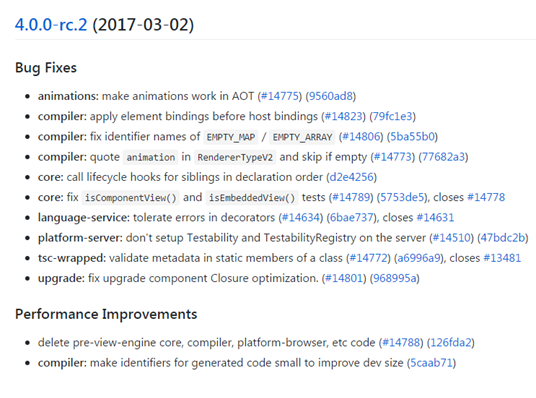 Use semantic versioning for signaling the content of Angular releases. Moved to time-based release cycles so that you can plan ahead. A deprecation policy so that you know how to get notified of API changes ahead of time. They clarified the distinction between stable and experimental APIs. They clarified the scope of the Public API surface. There will certainly be feature enhancements in version 4.0.0 which we can discuss here. Backward compatibility (mentioned above as well). A much smarter Angular compiler (ngc) for better error handling. Better runtime speed and parse time, and rest will come shortly. I put out more information as I’ll get it. Until then, happy reading!